Every horse shares a "birthday" of January first. A horse becomes one year old on the first of January after he or she is born, and turns two, one year later - regardless of the actual date of his or her birth. Or photo-finish in which two or more horses are very close at the finish line (one can "throw a blanket over them"). Very common in American Quarter Horse racing. When a horse gallops, instead of trotting or pacing, it's on a break. The driver must get the horse out of the way of the others, must not improve his position, and must attempt to get the horse back on its proper gait. A horse is not automatically disqualified by making a break. A racetrack with either a half-mile or 5/8ths mile oval. A male horse, age three or under. A type of wager calling for the selection of winners of two consecutive races, usually the first and second. A tie. Two or more horses finishing equal in a race. The amount that a winning or placed horse returns for every $1 that was bet. A wager type that requires the selection of the first two finishers, regardless of order, in each of the two specified contests. This wager type is also known as quinella double. A horse entered in a race is called an entry. On rare occasions, two or more horses are said to be coupled and run as an entry, comprising a single wagering unit. A wager on one horse of an entry is a wager on both. 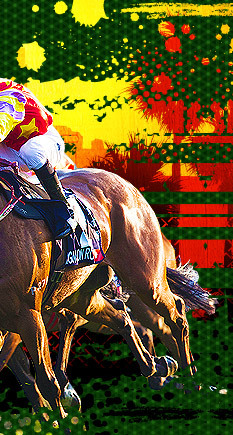 A wager in which all possible combinations using a given number of horses are covered. A female horse, age three or under. A horse racing on the outside without another horse directly in front of him or her. A foreshortening of the phrase first overland. One-eighth of a mile or 220 yards. Races are measured in furlongs. The condition of the racecourse (firm, heavy, soft, etc.). Official Jockey Club going reports progress as follows: Heavy - soft - good to soft - good - good to firm - firm. A horse that has not raced, or has raced only a few times. A race for which a handicapper assigns weights to be carried. Also, to handicap a race, to make selections on the basis of the past performances. A male horse, age four and up. The official who declares the placing for each race. A measurement approximating the length of a horse from nose to tail, about 8 feet, used to denote distance between horses in a race. Odds which are greater than 10:1. A horse (male or female) who has never won a racing purse. A female horse, age four and up. Approximate odds printed in the program and posted before wagering begins. This is a forecast of how the morning line maker believes wagering will occur in a particular race. Unit of measurement about the length of a horse's neck. Claim of foul lodged by rider, patrol judge, or other official after the running of a race. If lodged by an official, it is called an inquiry. A term to describe that the odds are greater than evens (e.g. 5 to 2), when the bookmaker's or totalisator's stake is greater than the bettor's stake. For example, a horse that is quoted at 4:1 would be odds against, because if it wins a race, the bookmaker or totalisator returns $4 for every dollar a bettor places on that horse, plus his or her original outlay. A person who sets the betting odds. Note that sportsbooks or bookies don't set the odds. Most major sportsbooks use odds set by Las Vegas oddsmakers. Odds of less than even money. This is a bet where you have to outlay more than you win. For example if a horse is two to one odds-on, you have to outlay two dollars to win one dollar and if the horse wins you collect a total of three dollars (the two dollars you bet and the one dollar you won). The sign displayed when result is confirmed. Also a racing official. Wagering at legalized betting outlets. The money a bettor wagers is called his or her outlay. A horse that is not expected to win. An outsider is usually quoted at the highest odds. A horse going off at higher odds than it appears to warrant, based on its past performances. When a horse is considered to have reached its peak for that season. A horse racing on the outside with at least one horse between him and the inside rail or barrier. A horse's position in the starting gate, numbered from the inner rail outward. The amount of prize money distributed to the owners of the first five or six finishers in a race (varies by state). A race without a purse or betting used to determine a horse's ability and manners. Horses that have made repeated breaks in stride or have been away from the races for a long period of time must race in a qualifying race before being allowed to race in a betting race. A wager type that requires the selection of the first two finishers, regardless of order, in each of the two specified contests. This wager type is also known as double quinella. A horse has received at least one official speed index rating of 80 or higher in racing. Qualified horses registered with the Jockey Club of New York City will be listed and treated as racing Register of Merit qualifiers for all purposes, except that they shall not receive a certificate of Register of Merit or year-end awards. Until 1956, a Grade A was a 75 or better speed index. From 1957 to 1975 Grade AA was an 85 or better. From 1976 to 1985 a Register of Merit could be earned by an 80 or better speed index, or by earning 10 racing points. From 1986 to present a Register of Merit could only be earned by a speed index of 80 or better. A non-pari-mutuel preparatory race, which conforms to requirements adopted by the state racing commission. A horse who is withdrawn before the race starts. An evaluation of a horse's time in a race versus the three fastest winning times for the same distance for the previous year at the same racetrack. A race that is run over five-sixteenths of a mile, or a shorter distance. The breed of horse used in harness racing, consisting of trotters and pacers. The term originates from the standard set in 1879 by the National Association of Trotting Horse Breeders in America, whereby a horse had to trot a distance of one mile in not more than 2 minutes 30 seconds to qualify for registration in the new breed. Strap or tape bandage used to tie down a horse's tongue to prevent choking in a race or workout. 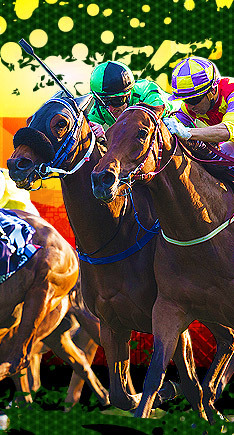 The automated system of betting on races that dispenses and records betting tickets, calculates and displays odds and payoffs, and provides a mechanism for cashing winning tickets, in which the winning bettors share the total amount bet, minus a percentage for the operators of the system, taxes etc. Synonyms include Tote and Pari-mutuel. The (usually) electronic totalizator display in the infield which reflects up-to-the-minute odds. 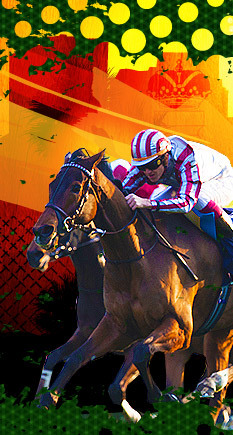 It may also show the amounts wagered in each mutuel pool, as well as information such as jockey and equipment changes. Also referred to as the Board. Returns from a tote pool (also referred to as a Dividend), calculated by taking the total stake in each pool (after the take out) and dividing it by the number of winning tickets. A dividend is declared to a fixed stake, for various win, place and forecast pools. A race in which eligible contestants compete to determine the finalists in a nomination race. The person responsible for keeping a race contestant in top racing condition. In Harness racing the trainer is often the driver.